Abby Gilleland (No. 3) celebrates winning a point with Ali Lake against Virginia Tech. 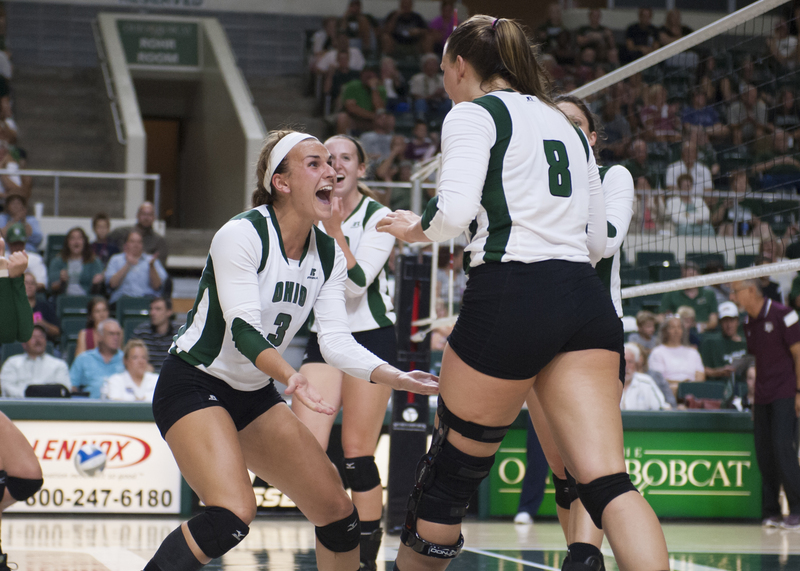 Ohio defeated Bowling Green in three sets on Saturday. Photo by Carl Fonticella. The Ohio Bobcats were able to water their winning streak to grow into a healthy seven after defeating the Bowling Green Falcons 3-0 in their game Saturday night. Even though Ohio pulled away with a victory, it wasn’t one of their more dominant ones. Bowling Green held a lead for the majority of the first set, leading with a margin of two at 14-12. Ohio wanted a change of momentum, though, as it went on a 4-2 run to tie the score up at 16. This wouldn’t keep the momentum on either side, however, as the lead would then wobble back and forth between the Bobcats and Falcons. Tied at 24, Ohio’s Jaime Kosiorek killed in a point and the following serve BGSU committed an attack error to give Ohio the first set. In the second set Ohio was able to maintain a lead throughout. The Green and White were able to lock down the 2-0 with a Karin Bull kill and a Kelly Lamberti service ace. After winning the second set 25-16, the Bobcats looked to get the sweep by winning the third set. Unlike the previous set, this one did not have a “bobcat-dominant” look and feel. Ohio didn’t hold a lead until the Falcons had already put 14 points on the board. Ohio then began to shift the chances of winning in its favor as the offense started clicking. After a 14-all tie, Ohio went on a 11-7 to win the set 25-21 and secure a match win. Ohio was led by senior Kelly Lamberti, who recorded her eighth double-double of the season. Freshman Jamie Kosiorek also had 12 kills and two service aces. Bowling Green (4-14, 1-5 MAC) was led by Nicole Slimko, who had 13 kills. With this victory, Ohio moves to 13-4 overall and continues their dominance in the MAC East, still remaining undefeated at 6-0. The Bobcats look to continue their dominance against Ball State as they face off against the Cardinals in Muncie, Indiana, on Friday night.